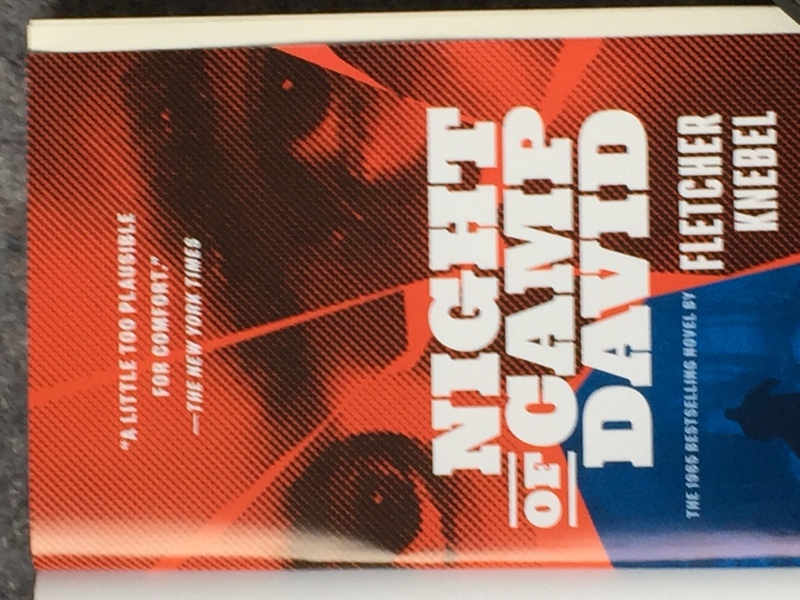 The novel Night of Camp David by Fletcher Knebel was published in 1965. It was republished late last year. 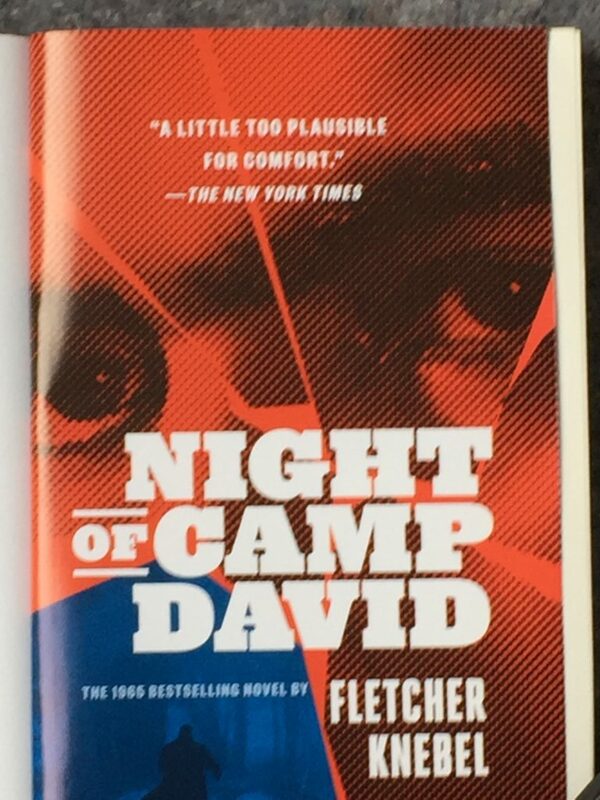 On the front cover there is a quote from the New York Times (according to President Trump, one of the pre-eminent purveyors of “fake news”) that says of the book ‘A little too plausible for comfort’. When I first saw that I presumed it was associated with the reissue. Apparently not; that was written in 1965. You can see from the image on the home page what the 2018 edition has done by way of amending the cover. I’m figuring that no explanation is necessary as to whom that rebrand might be referring to? The book is set in what was then the near-future, 1976. The fictional (Democratic) president is Mark Hollenbach. Like Trump, he’s pretty much teetotal. Unlike Trump, he is manifestly not a skirt-chaser. Hollenbach is also paranoid and sees everything as a plot against him, not least by the press. “I am delighted to be here this evening,” he says to an audience, “and hear the nation’s leading newspapermen tell the truth about me – for a change.” I mean, you couldn’t make this stuff up. Well, Knebel did and Trump does, but I’m sure you get my point. Jim MacVeagh is a young senator with whom the president shares his concerns about America and the world. MacVeagh is invited to a late-night/early-morning meeting at Camp David in Maryland, which was the president’s official retreat until Trump preferred to use his own golf club in Florida. What at first seems like privileged and personal access to the most powerful man on the planet soon assumes a different perspective. MacVeagh thinks he’s listening to the ramblings of a madman, and what’s more a madman with access to nuclear weapons. What should he do? Who can he tell? Who would believe him? Trying to resolve these problems cause enormous angst to MacVeagh. Among those he has to meet is Judge Cavanaugh, an eerily-named forerunner of Judge (Brett) Kavanaugh. When the book was initially published, congress was discussing what would later become the 25th Amendment – the possible removal of the president, to be replaced by the vice-president, if the former was deemed unfit for office. As one politician says in the novel, “nobody – but nobody – in this country can tell a president of the United States that his mind is sick”. That is the dilemma facing MacVeagh and others as the book approaches its denouement. Is the president nuts or not? A piece of self-analysis by Hollenbach may be insightful. “The president is in command so constantly. He is Number One. He is never denied. [If we don’t count walls with Mexico.] He is king for his term. So, it is only natural that a president begins to think of himself as the country.” Can you think of a better way of summarising Trump’s behaviour? Elsewhere in these pages, one disgruntled gentleman is pondering the state of the nation. “One thing was sure,” he thought. “This year they ought to clean out that indolent gang in Washington – from top to bottom.” I believe that these days they call it “draining the swamp”.